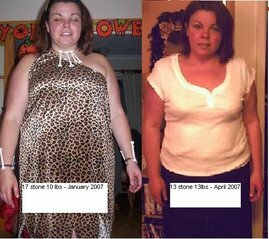 The Weight Watcher: 17 Day Diet... Does it work? Another diet, another gimmick... And guess what, this fad diet doesn't even pretend to live up to its name. Forget 17 days, this one needs a 51 day commitment! Like most diet plans, the 17 day diet is about eating less, moving more... packaged up nicely and marketed by its USP - the 17-day cycles. Why, oh why, do they keep putting this stuff out. And - more importantly - why oh why do the public keep lapping it up??? Fear laced with confusion is my best bet! We all know - far too well - thanks to government health campaigns and the drugs companies - why need to keep trim: heart disease, diabetes, cancer, stroke, etc (I could go on for days!). But when it comes to slimming down and finding the right path the marketeers are having a field day - if you pay them enough attention! Sadly there isn't a glamorous way out of being overweight, obese or even morbidly obese (as am I!). There are just two golden rules to losing weight: understand what foods contain in terms of nutrition (calories, sugars, fats) and keep your intake in check. The old adage of eat less, move more isn't quite so. Yes, eating less bad foods is a good thing, but surely you need to eat more good. And that old adage of moving more has been disproved by medical research at playing a key role in helping people lose weight. Of course, exercise helps keep weight gain at bay while delivering fitness benefits ( and cosmetic ones to boot)! With so much confusion out there between good foods and bad foods, is it any wonder that we're facing an obesity epidemic while millions in the world starve?